One thing I’ve noticed over the years of studying Myers-Briggs® personality theory is that a lot of sensors are getting mistyped as intuitives. This is kind of sad because knowing about personality type really can’t help you if you’re looking at the wrong information. Tests ask questions like “Do you focus on all the details or the big picture?”, or “Are you fascinated by possibilities?”. These poorly-worded questions are meant to determine if you have a sensing or intuitive bent, but any sensor or intuitive could answer yes to these questions because they all focus on details, some just focus on sensing details, some focus on conceptual details. Some focus on practical possibilities, others focus on innovative possibilities. We need a better way of determining what types we are. Also, keep in mind that every single person uses intuition and sensing. We just want to figure out what someone’s first preference is. Think of it this way. You have two hands. You favor one over the other, but you still use the other hand! In the same way we all use Sensing and Intuition. One is more natural and more comfortable for us to use, and the other is more uncomfortable but we still use it daily. So which preference do you prefer? Sensing or Intuition? Let’s find out! What’s the difference between a sensor and an intuitive anyway? Sensing and intuition are both perceiving functions. These functions determine how you take in information around you. A sensor relies on his five senses the most. They think about what is happening in their immediate environment; what they can see, smell, taste, and hear. Sensors tend to be very practical, and they like everything they talk about and do to have a real-world application. They are realistic and grounded, and are more likely to accept things at face value. Because of their sensing nature, they are very aware of their environment, and what’s going on around them. When sensors speak, they prefer to speak in a concrete, literal way as opposed to using a lot of metaphors. There are many varieties of sensors; some will be more logic-oriented (the thinker types) or values-oriented (the feeler types). Some will be more concerned with plans and closure (the J types) or an open-ended schedule and spontaneity (the P types). There are also two different types of sensing; Introverted and Extraverted Sensing. You can find out more about that here. Intuitive types perceive the world less through their five senses and more through patterns and impressions. They are less aware of the “here and now” and more concerned with future possibilities and meanings. Intuitives are less concerned with what things are than what they mean. They read between the lines and are abstract thinkers. They tend to be more conceptual than practical, and easily get bored with routine. When an intuitive is speaking, you will likely hear lots of metaphor and comparisons and symbolic word usage. When processing information, the intuitive is less concerned with facts than possibilities. What’s around the corner? What does that mean? What is the relationship between this event and that event? They will be more prone to thinking about philosophy, hidden meanings, and will enjoy talking about novel ideas or theories. There are many different types of intuitives; the rational NT types, or the idealistic NF types. They can be more prone to being spontaneous and laid-back (NP types) or more fond of planning and closure (NJ types). There are also two different styles of intuition; Extraverted and Introverted Intuition. To find out more about these two different types of intuition, click here. – Sensors tend to be practical and down-to-earth. – Sensors focus more on the present (today, this week) or the past than the future. – Intuitives focus more on the future than the present or the past. – Sensors prefer to talk about what is happening or has happened. They are more concerned with the details, and will have more descriptive or literal details in their conversation. – Intuitives prefer to talk about what things “mean” or symbolize. They are more concerned with the overall big picture, and can gloss over a lot of the sensory details. – Sensors prefer to speak literally. – Intuitives prefer to speak metaphorically. – Sensors will get bored more quickly talking about theoretical or abstract concepts. – Intuitives will get bored more quickly talking about day-to-day, practical topics. – Sensors like to “do” things. They aren’t likely to sit and just think or daydream. They’re more likely to be working on a project, playing a game, watching a movie, cleaning, building, always “doing”. – Intuitives like to analyze. They want to think, reflect, study, experiment, innovate. They can be action oriented, but that action almost always lines up with their future-oriented vision. – Sensors tend to think, speak and do things in a linear fashion. A leads to B which leads to C.
– Intuitives like to start a story or project with the “big picture” in mind, and then fill in with details as necessary. As far as how these two types get along, sensors may really enjoy intuitives, and vice versa. We can all get along and appreciate each other, but there usually is a tendency for us to see each other in a light that is clouded by our own preferences. Not excited enough about the future. Too focused on the present. Is One Preference Better Than the Other? In a lot of typology forums and groups you will hear or read biases. Intuitives may think they are the superior types; deeper, and more intellectual. Sensors may think they are more superior; more practical and focused on what’s really important right now. No preference is better than another. We need both intuitives and sensors to have a world that functions and progresses in a healthy way. Both types have their strengths and their weaknesses. The intuitive can appreciate the physical awareness and detail-oriented nature of the sensor. They can appreciate their down-to-earth demeanor and rich memory of past experiences. Sensors can appreciate what intuitives bring to the table; a rich imagination, endless possibilities for the future, and deep intellectual insights. The sensor can help the intuitive to access their least preferred functions and have a balanced approach to life; and the intuitive can do the same for the sensor. Relationships and friendships between both types can be extremely beneficial. I peg out N. The greatest insight I gained from the MBTI (many years ago) was how to better understand Ss. Knowing now how some people prefer to attack projects step by step, rather than seeing “immediately” how they will turn out, greatly increased my patience. In partnership, I have often depended on an S to make sure all the details get covered. Things that my big picture focus often cause me to overlook. I feel very much the same. An N and an S together can definitely make an awesome team. A lot of people say they aren’t very compatible, but I believe that if both are willing to work on understanding each other’s preferences it can be a great friendship or relationship. The step by step project style is more common in SJs than SPs… A lot of S vs N descriptions don’t succinctly capture the difference between S and N people. SPs can be quite big-picture focus, but in the moment. Also a lot of N people who are extroverted (ENFPs, ENTJs for example) like to be out there doing things and don’t spend time reflecting much. What I notice as the key difference between S & N people is that S people will discuss their experiences & the now/ the past while N people will discuss ideas and the future. For example, an ESFP would talk about the hot girls they have dated while an ENFP would discuss solving world hunger and their future career plans. It is very easy to tease apart a S and an N from minutes of conversation with them. A lot of MBTI websites don’t do S people justice. S people like to discuss topics pertaining to the current environment and their experiences. S people can be deep too. When I go fine dining with a SP type, they often have “super taster” abilities and can distinguish different cuts of steaks etc. S people focus on the quality of sensory experience and can recount a ski trip etc in vivid detail. STJ people focus on delivering high quality work and are often meticulous with detail. Sensors who grow up in family environments emphasizing education and knowledge would often be quite well educated too and do well in school. Topics of N people revolve around the abstract, like whether singularity will happen due to the exponential growth of technology (NT), or solving world hunger (NF). N people often take a conversation to a “deeper” level. This is not to say that N people cannot be light hearted and cheeky, many ENTPs and ENFPs often have an “easy to get to know” personality and are chameleons who adapt to the social mood. Most NTs are great at wit and sarcasm while NFs are great at maintaining social harmony and empathizing & validating individual differences. I absolutely agree with you! In fact, one of my big pet peeves with MBTI aficionados is the ‘intuitive bias’ or attitude that sensors are somehow less interesting. 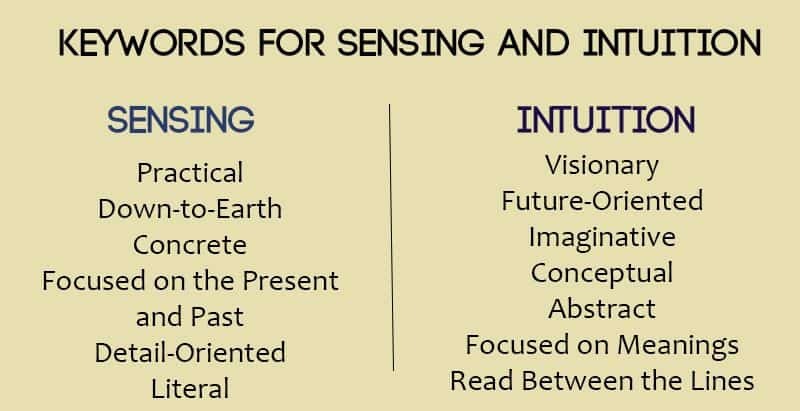 This is why I tried to make it clear in this post that sensors and intuitives both use sensing and intuition, one is just preferred over the other. It’s also why I try to frame tendencies with words like ‘often’ or ‘tend to’. I’m close friends with several sensors who I can have very deep conversations with – they’ll tell me openly it’s not their natural happy place, but they enjoy it from time to time. I also agree with you about SP types and their “super taster” abilities – I’m married to an ISTP and can vouch for that! Also agree with you about STJ types – this post doesn’t get into as much detail about the difference between Si users and Se users – I mainly wanted to help people understand the very basic differences between Sensing and Intuition because a lot of my friends were getting mistyped on the online tests and needed an easy-to-understand idea of the difference between sensing and intuition. Agree with everything you said! I find the S vs N dichotomy the most challenging to explain, so I apologize for the previous message. 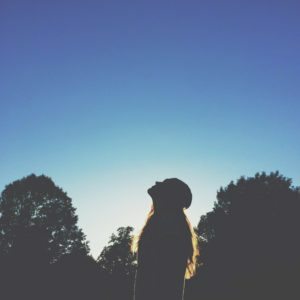 Thank you for writing this post to help others figure out their true type. I’ve noticed the Sensors mistyping as Intuitives problem too! Do you think it happens more often with SJ or SP? Or does it affect both equally? Do you think the best way of teasing apart sensors and intuitives is the type of conversation they prefer (or find more natural to engage), big talk or small talk? Usually you can tell whether someone is N or S within 5 mins of the conversation because when two Ns talk, the conversation will quickly move past small talk! My NI is teorically tertiary (ISTP). Probably why I feel so close to INTJ.T. But INTJ seem abstract in any field. ISTJ seem not attracted by creativity and they are very conventional. Paradox, Intuitive dominant or auxiliary seem very sensitive to the noise. Me too but apparently it’s not a trend of ISTP. I see big, finished, profound and structured abstract or not, without being disciplined like a J.
I dream, I planed, I m secretly emotional I think about futur, without extrem precision and all the day but I have a creativemind. I m rational for sure… But the feeling is a powerfull motor. My NI is teorically tertiary (ISTP). Probably why I feel so close to INTJ.T. But INTJ seem abstract in any field. Without concret experience. I am supposed to be an ISFJ but I am not a conventional person, I like art and have deep conversations, I also use a lot of metaphors. ISFJs are definitely not all conventional! They tend to enjoy traditions, but those traditions can vary depending on so many factors. And many ISFJs enjoy art and are very creative. I’ll have to look through this article again (I wrote it several years ago) and see if there is some inaccuracy in here that is giving that impression.